A young family from the Brazilian city of São Paulo purchased a waterfront apartment that turned its back on the spellbinding Atlantic Ocean views. In response, all existing walls were removed to make way for an open plan that divided two bedroom suites with a central living space. The clients were interested in a minimal yet colorful aesthetic, seeking a balance between their admiration for disciplined modernism and their native tropical exuberance. The overall interior design of the project is as casual as its beach setting. 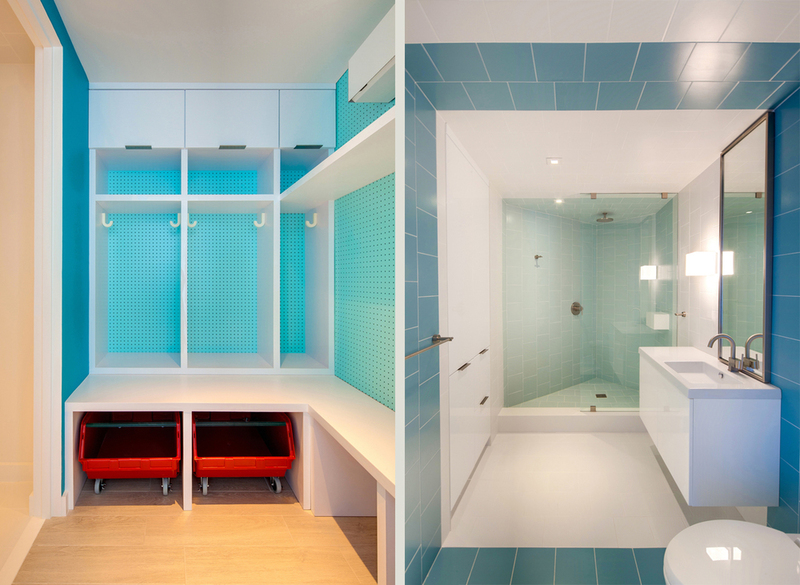 Inspired by Miami’s colorful lifeguard stands, spaces are defined by turquoise and aqua-colored walls, with accents in red. Floors are in a light taupe tone reminiscent of the sandy beach below. And white built-in custom cabinets are juxtaposed to an assortment of weathered woods, such as the maple butcher block in the kitchen counters and the rustic white oak picnic table in the dining area. Within each bedroom suite, different aspects of the beach were used as design inspiration. The master suite has a wall clad in lap-siding behind the bed, very similar to those used on beach stands; and blue hand-made mosaics mimic rippling water in the shower. The guest suite is the children’s area, and is inspired by the beach ball: a variety of colorful stripes adorn the back wall of the bedroom, while the restroom has continuous slices of blue, aqua, and white tones traveling from floor to wall to ceiling and back.